I thought I would pay the old boys a visit, at the family ancestral home. I am picture perfect in the beautiful Azul’s Anjelica Gown! This gorgeous black and teal gown was worn by the most gracious Anjelica during the evening part of the Miss Virtual World contest, in which she won! She looked exquisite in it! I think the old boys would definitely approve and give me the proverbial family thumbs up representing our peerage in my elegant Azul Anjelica MVW 2014 Gown! As the Queen slowly turns around, she yells “OFF WITH YOUR HEAD”, if you do not make it to The Fantasy Gacha Carnival to get these most charming Enfant Terrible’s Fashun Crowns and Staffs! Although caught in one of those “queenly moods”, whispering to you…she almost had to wait on her crumpets, she wears the Rare Pastel Blue Crown beautifully and holds, regally, her symbol of power, her Rare Blue Pastel Staff! This amazing and whimsical crown and staff are among the gachas, from Enfant Terrible, that you can win, starting February 1st at The Fantasy Gacha Carnival! 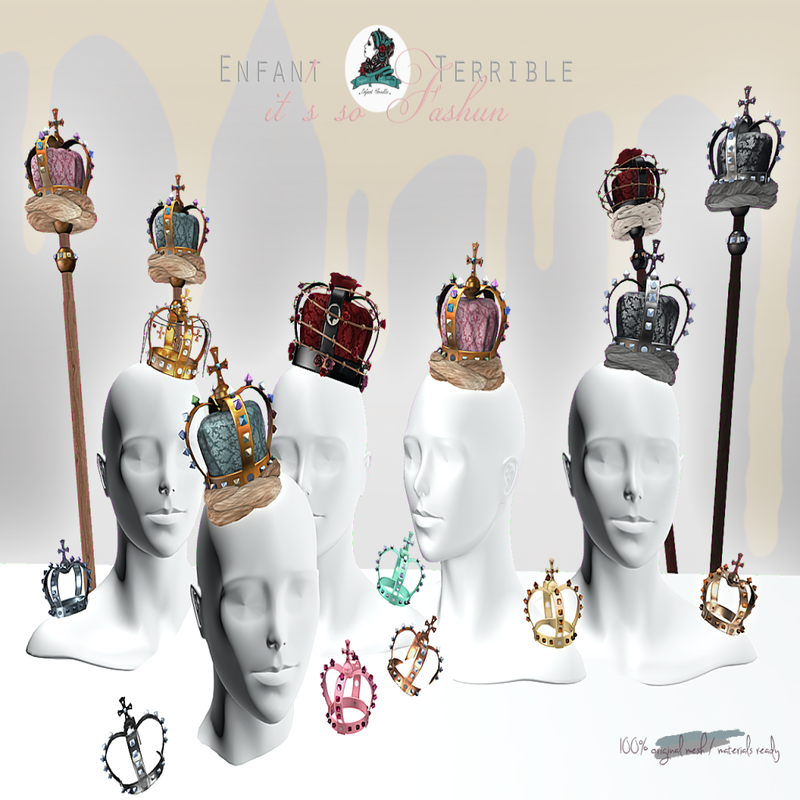 The Enfant Terrible’s Fashun Crowns and Staffs are great for role play, and also make a phenomenal fashion statement when worn with your favorite outfits! Do not incur the wrath of this queen! Be sure to grab the Enfant Terrible Fashun Crowns and Staffs at The Fantasy Gacha Carnival! Start saving those Lindens and have fun!!!! 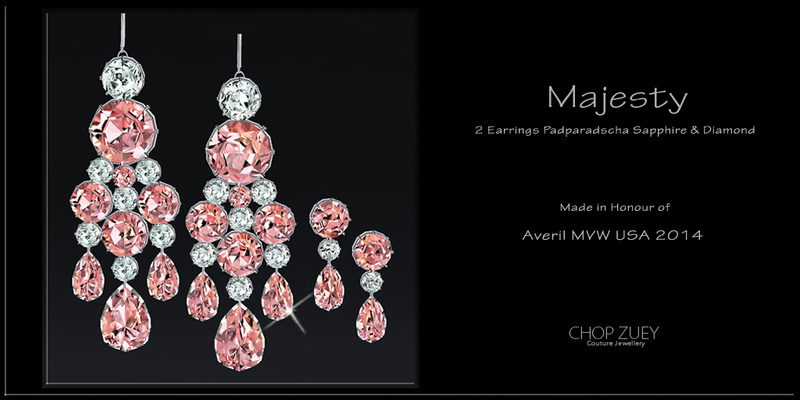 Just Give Them Pink and White Padparadscha Sapphires and Diamonds, Ma chère! The Duke couldn’t believe his ears when he said to his beautiful, delightful, over indulged, but emptied headed wife, who brought to him more land and riches with their marriage, “PEOPLE ARE STARVING WOMAN” he roared, that she was heard to uttered back to him, “just give them Pink and White Padparadscha Sapphires and Diamonds” ma chère as she absently continued to admired herself wearing the very stunning Majesty Necklace! It is obvious that the premier jeweler, to Kings and Queens, Chop Zuey, has paid a visit with another superlative suite of jewels, that she could not and will not live without and would drive him to debtor’s prison to possess! Chop Zuey was THE jeweler to only the most fashionable of courts throughout the land and could be counted on to supply only the finest creations bar second to none! 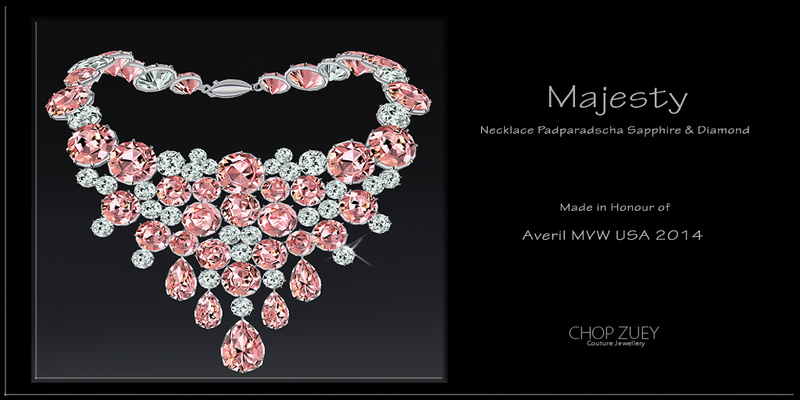 The exquisite suite that has been commissioned, designed, and created by Madame Belle Roussel that now fascinated his Duchess, consisted of The Majesty Bracelets, a amazing design mix of Brilliant Round and Teardrop stones of Padparadscha Sapphire & Diamonds, a superb Bib Dropped Necklace crafted of the best Padparadscha Sapphire & Diamonds set in Brilliant Round & Teardrop shaped stones nestled in a Platinum setting, gorgeous Padparadscha Sapphire & Diamonds Earrings, 2 sets, one a Chandelier and the other a short dangle style both in a platinum bracket, and a flawless, elegant ring in the same magnificent Padparadscha Sapphire & Diamonds in a platinum basket setting that boasted a 3 carat Round Brilliant and Teardrop Cut stones, in the ring and on the finger band. The Majesty Jewels is aptly named, she said smiling to her servant, as she pictured herself before the King’s court wearing this most striking set! Get my dressmaker, I must have a dress to match! But before you do….move the mirror a little to the left, so I can see myself better! The Duke, thinking to himself, she is as silly as one of her cousins, who he heard is rumored to have said “let them eat Cake! Hmph! Grumbling to himself, must run in the family, as he shakes his head and orders payment and a raise in taxes! 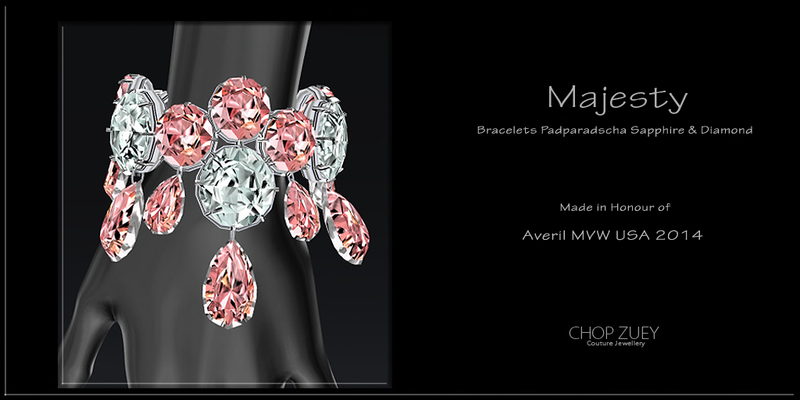 The Majesty Suite was made in honor of Averil, Miss Virtual World USA 2014. I always find it really cool to find hidden rooms or spaces, filled with interesting things, such as the space you see here! 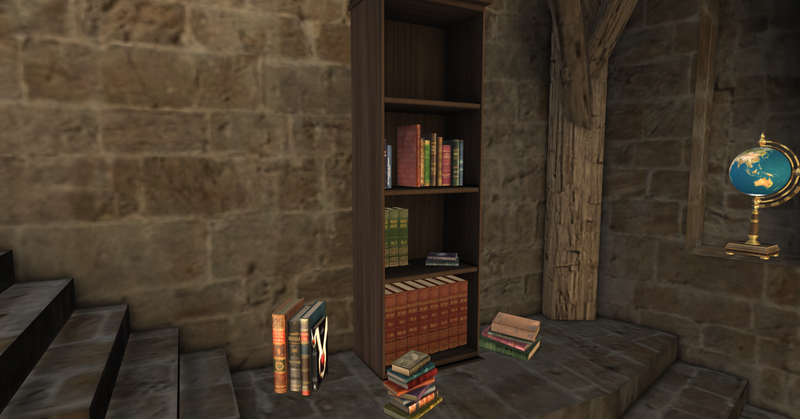 As you look closely, this hidden room is rather inviting looking with personal items belonging to the owner. 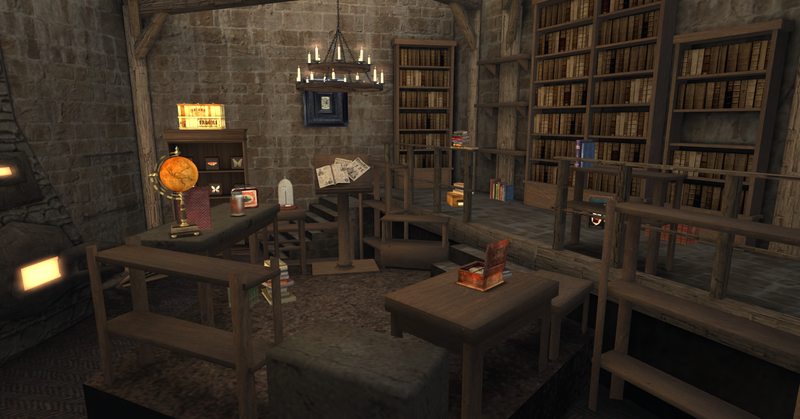 The creations from Arcana Antiques & Oddities gives life to this space making it less gloomy and actually a place where you would want to explore. Let’s see what’s here together! 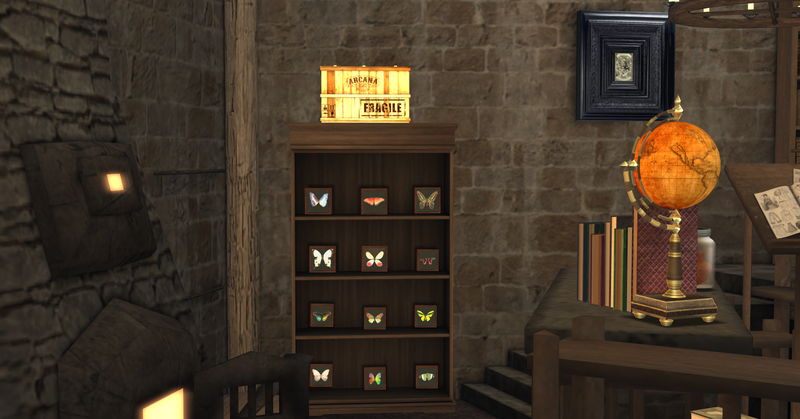 In the far corner, I spy a large Curio Bookcase that houses Insect Specimens, Butterflies! This is a great collection of Butterflies of all kinds and varied colors! That means our owner is interesting in the study of insects. 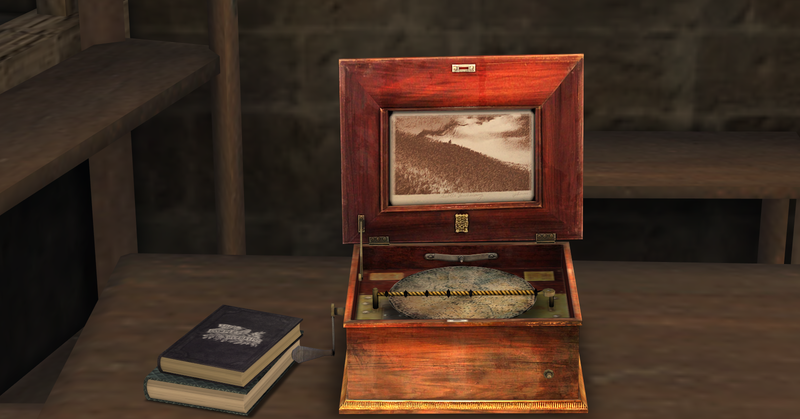 In front of that on the tables and podium, I see our hidden room owner has a really niffy looking Vintage Lunch Box-Stamp Collection Red, they are into antiques, smiling, a Human Specimen of a Heart in a jar, no less! 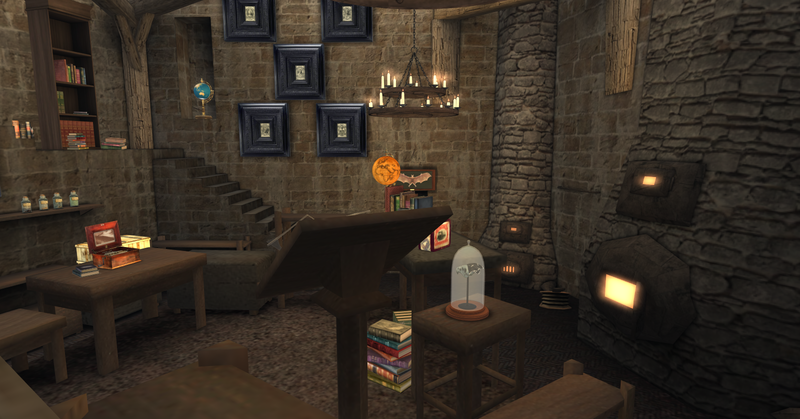 a Animal Specimen of a Crow Skull, under glass, a Antique World Globe II, several books piles of books, and books behind the small landing, and throughout the room, which indicates that they are a voracious reader! The books have such illustrious classic group titles as Stevenson Collection, Novels Collection, Vampire Collection, Medicine Collection, Modern History, Spanish Collection, Horror Collection, Encyclopaedia Britannica, and The Lord of the Rings, they are well read indeed! 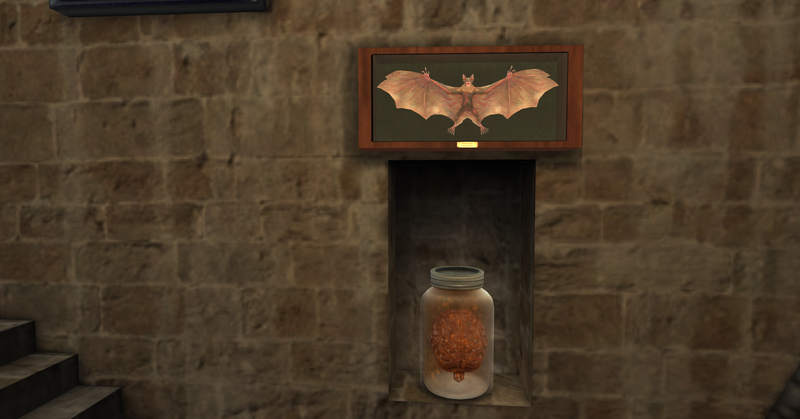 Mandrake/Mandragora….ooh I know what mandrake is used for, winking! 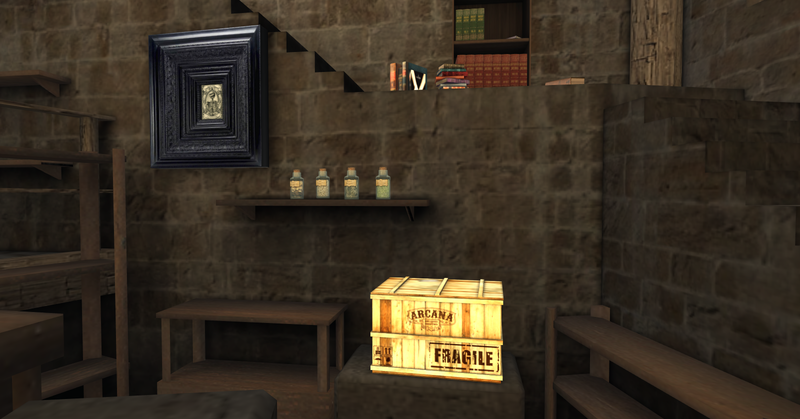 Overall with the items in this room, our hidden room owner, is one very interesting person! Now it is time for me to leave as I haven’t been caught! 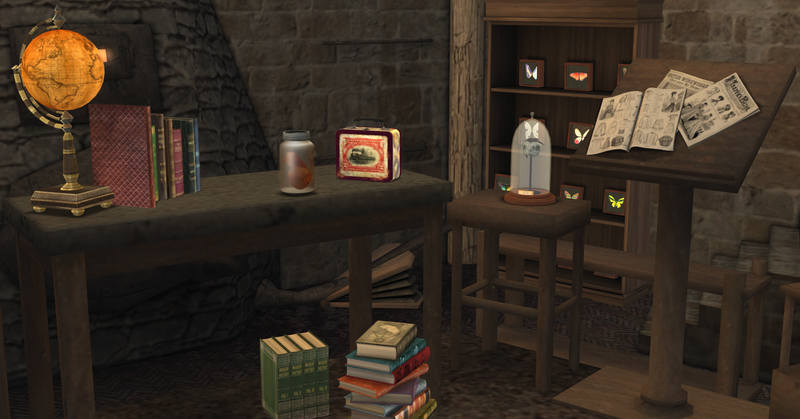 All these very creative, innovative and awesomely cool items mentioned here can be found at Arcana Antiques & Oddities. 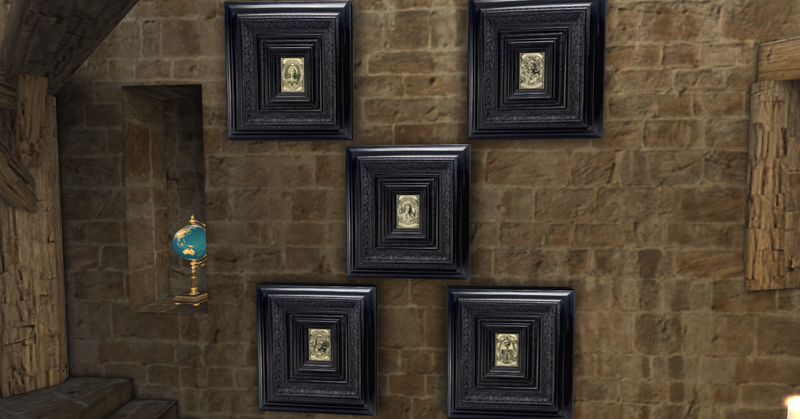 Enfant Terrible is at Oh My Gacha until January 31st! Don’t miss out on these adorable deer headbands! I am wearing Miechief Rare Headband…they are just too cute for words!!! I have included the ad for you to see the whole range of headbands you can win! I am also wearing Enfant Terrible’s, very figure flattering, Phyllidas Gown in Ice and Wayfarers Sandals Light Grey with Silver Trim. I just love how I look!!! Enfant Terrible Ads for Oh Deer Headbands, Phyllidas Gown, and Wayfarers Sandals. You ever see something and instantly love it? Well I am in love with The Claw. The Claw Boots by Wicca’s Wardrobe called to me! So I decided to build a styling around the boot! Gareth Pugh came to mind and I came up with this look to showcase these fantastic, edgy, avant garde, boots! They are totally sold out at The Couturier’s Dock, but a little birdy told me that they will soon be available in other colors! They totally rock the look and I am very happy with how the overall styling turned out! My Leather Black Claw Boots have a awesome Black Claw Boots Texture Change Hud that controls the color of the ankles, toe tips, heels, and studs. You can change these colors to Silver, Black, or Gold! My pictures do not do these boots true justice! 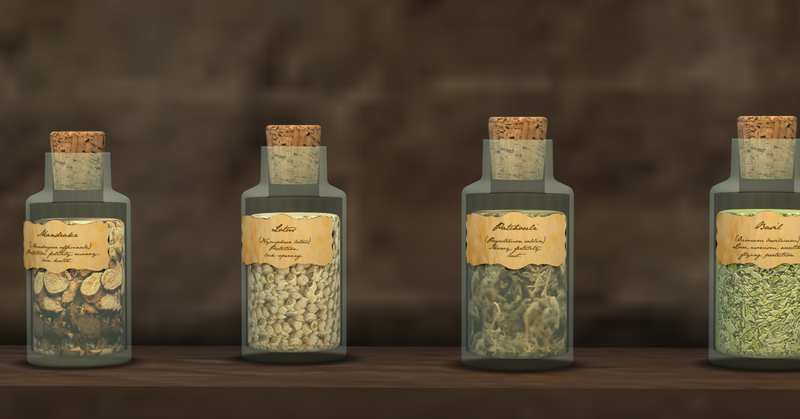 Wicca Merlin is a phenomenal influential tour de force within the Second Life Fashion World! Many models try to emulate her, but never reach her level and ability of style! In addition, to making poses, she is now designing! I can’t wait to see what else she comes up with, cause if these boots are any indication, it will be great things! This blogger waits, with bated breath, for your next release! Major Kudos Wicca! I remember the day that I nervously messaged the sublimely talented Enzo Champagne of Sparkling Champagne about doing my National Costume, for the Miss Virtual World Contest. I didn’t have much experience at doing contests that is on the exalted level of MVW, which is THE contest of all modeling contests and most recognized for models nor asking famous designers for help. Being Miss V♛Egypt, I wanted to chose from Egypt’s culturally rich past, for my national costume. I chose Cleopatra VII, as she was beautiful, could charm a ruler and bend him to her will, was highly intelligent, a great strategist, and was always aware that she was a woman…desired! I communicated all of this, clumsily, to Enzo and he delivered this golden dream worthy of Cleopatra herself! I may not have won the crown for MVW, but he made me look like a queen! A sensual, desirable, and beautiful queen! During the chat during the National Costume Segment, he made me so beautiful that I was being likened to a young Elizabeth Taylor, when she played the extraordinary queen in the block buster movie, Cleopatra! Smiling, I looked amazing sitting upon my litter, as I was carried unto the stage! The many details of my costume, are superb! Beyond the ladies who love great designs such as this, I can already picture the role-play of the many Egyptian “Queen Cleopatras” in Second Life wearing and loving my National Costume! From the depths of my heart, Thank you, very very much, Enzo, for my incomparable, gloriously golden, out of this world, Cleopatra National Costume! You are a master designer! 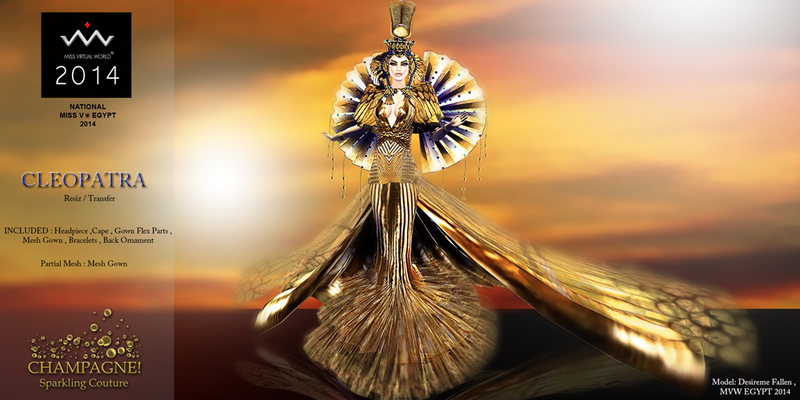 My Cleopatra National is the best in ALL of Second Life and beyond contestation! 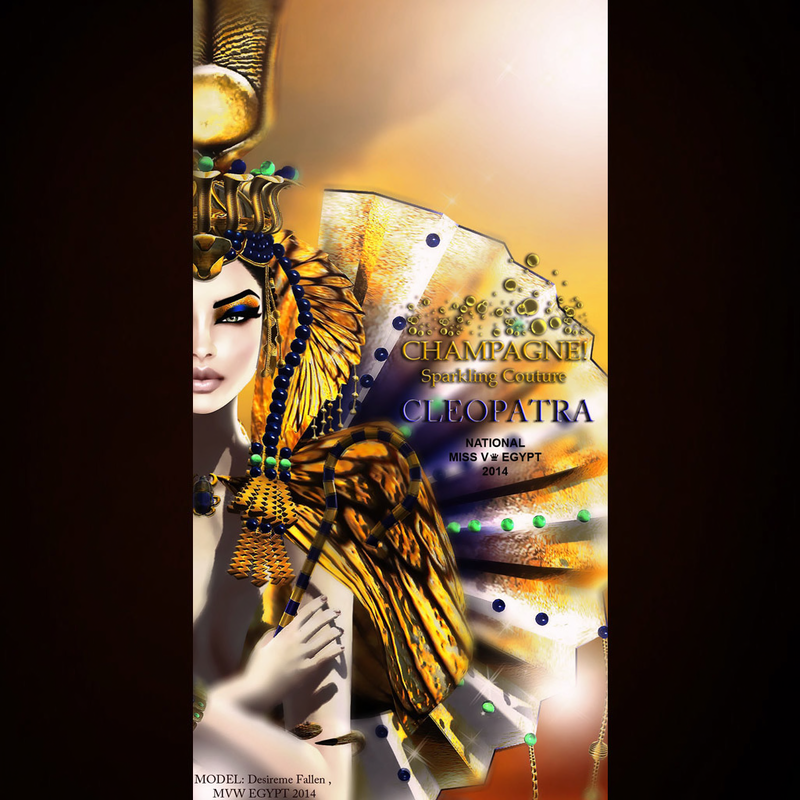 This magnificent creation, Cleopatra, is now available for purchase at Sparkling Champagne!